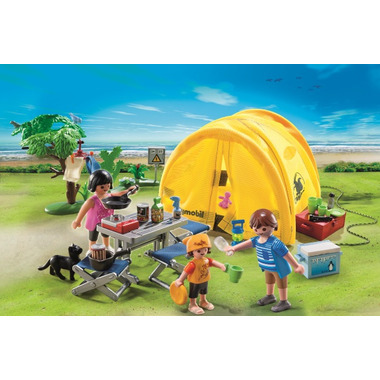 Have some fun in the sun on the Playmobil Family Camping Trip! Sleep in the pop-up tent, and enjoy an outdoor meal on the folding table and chairs. Heat up meals in the pots and pans on the hot plate, and sip on a refreshing beverage from the cooler. 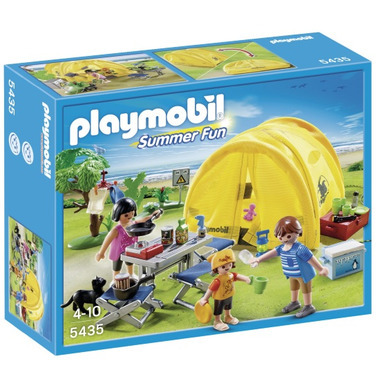 Set includes three figures, pop-up tent, foldable table, foldable chairs, cat, clothes hanger with clothes pins, towels, cans of food, cups and plates, lantern and other accessories. The foldable pop-up tent can accommodate a family of four. Combine multiple sets for added fun! I got a bunch of Playmobil sets for my 4-year-old. She loved them all. Great toy, highly recommended.